It’s the gift bag, stupid! First off, I hope you all get that this post’s rather silly headline is a play on a phrase that was common during Bill Clinton’s presidential race against George Bush: “it’s the economy, stupid!” If not, I apologize for the poor reference. Bear with me, I’m new to this! Moving on…. Chelsea Clinton’s wedding to Marc Mezvinsky was one of the most widely publicized ceremonies there has been in quite some time. I would be foolish not to write a little something about it. However, while most are swooning over the choices in attire, I’m going to focus on my favorite part of the event: the gift bag. The gift bag itself, image courtesy of asicentralblog.com. A glimpse at the contents of the bag, photo courtesy of TMZ. The gift bag included a number of amenities including a bottle of wine from Clinton Vineyards, Fresh beauty products, a Rhinebeck notepad and pencil, and various snacks including pretzels and fruit. To me, however, the contents are not the most important part of this swag bag — the beauty lies in the presentation. Labeling each item with a word starting with “S” (for example, wine labeled “sip” and notepad labeled “scribble”) adds a sweet touch and pulls the whole thing together quite nicely. This element of the Clinton-Mezvinsky wedding is something anyone can emulate regardless of whether or not they have the seemingly endless funding of Chelsea and Marc. 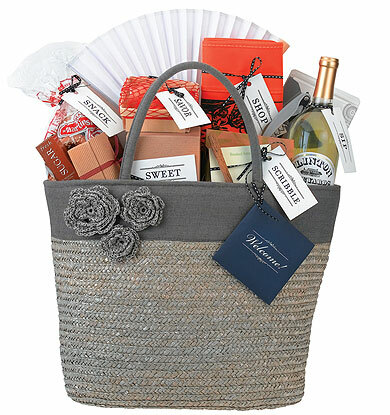 To accommodate a smaller budget, full-sized bottles of wine can be replaced with small sippers with personalized labels, cheap travel-sized bath products can replace pricy cosmetics, and the bags themselves can be replaced with plain canvas bags that can go unadorned, or be DIY-decorated for a personal touch. To further personalize a gift bag, write the labels yourself on gift tags and add a handwritten card in lieu of the typewritten stationery in Chelsea’s bags. Make it fun! Creating these gift bags with your bridesmaids can be an amusing reprieve from the many schedules and tedious details of planning a wedding.